Boston Bomb Club is without a doubt one of the most unique puzzle games ever created, although not necessarily one of the most comprehensible. As one of the world's most famous scientists in the 19th century, your favorite pastime is devising bizarre mazes made up of trampolines, wheels, steam engines, etc. and roll bombs into them to hit the destination safely. 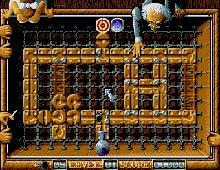 It's a fun action / puzzle game that, like most of other Silmarils games, could benefit from a better interface.